Tommie Bass was a special character in the herbal folklore of the South. Born the son of sharecroppers in 1908, he began gathering herbs in the hills and valleys of Lookout Mountain in 1915. 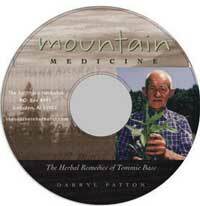 Continuing for the next 81 years, Tommie became famous for his encyclopedic knowledge of medicinal plants. He also came to be known as a link to the distanct past of the rural South. This CD contains an hour long talk by Tommie as he discusses topics ranging from gathering herbs in the days of horse and buggy to trappers and moonshiners.